BIM competencies will be identified through peer-reviewed research, industry surveys, and the specialized knowledge and experience of industry associations. BIM competencies will be clearly and consistently defined through a BIM dictionary clarifying BIM terms and acronyms across all topics; a syntax governing how BIM competencies are structured; a top-level taxonomy organizing BIM competency items into tiers, sets and topics; and a number of classifications (e.g. role groups, disciplines, difficulty levels, delivery modes, etc.) to filter BIM competencies to match learner requirements. A dedicated online BIM learning hub (refer to BIMexcellence.net) will be developed to collate competencies, and organize the development and delivery of BIM learning modules. A cooperation framework between industry associations will be formulated to encourage BIM-focused, collaborative Continuing Professional Development (CPD) across disciplines, specialities and industry trades. An academic framework for tertiary and vocational BIM education will be adopted/adapted to encourage academic institutions to contribute-to and benefit-from the BIM learning hub. A BIM institute will be initiated to facilitate the development and delivery of BIM learning across industry sectors; develop and maintain classification systems for organizing BIM learning; develop and maintain the BIM learning hub; develop a coordination framework between professional associations for the purpose of multidisciplinary BIM training and continuing professional development; initiate BIM collaboration labs for sharing knowledge and testing/demonstrating new workflows; conduct BIM-usage surveys; publish relevant papers and reports; and act as a central social space for all BIM learners and BIM learning providers. This partial workflow (a subtype of conceptual models) uses BIM competency items from across several Competency Sets to clarify a specific process - how to initiate a collaborative BIM project. 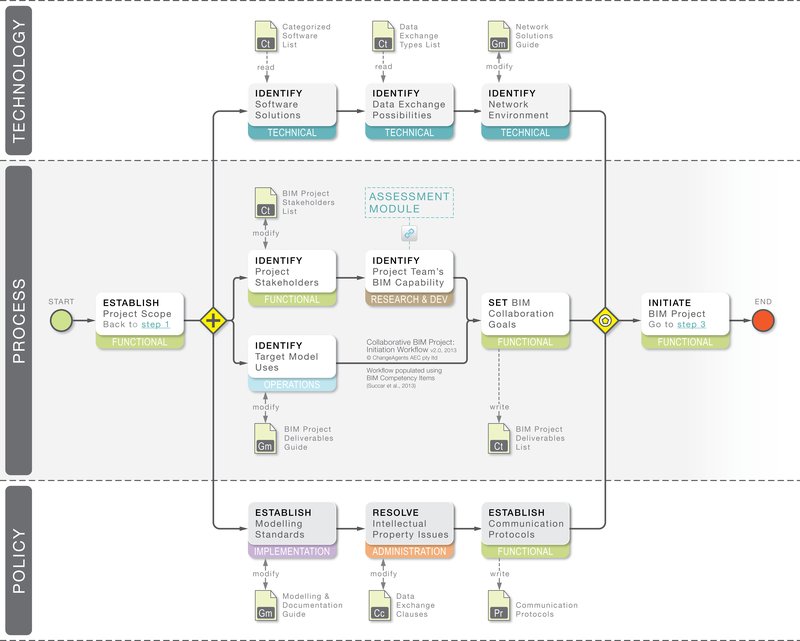 The BPMN concepts are represented at low detail and can be expanded into several sub-processes populated with competency items at higher levels of detail. Establishing project requirements for the purposes of procuring services - e.g. through using competency items to populate a request for qualification or request for proposal. ASSESS (measure): Do you have the ability to prepare a 3D model for the purpose of linking it to a Construction Schedule? ACQUIRE (learn): At the end of the course, students of <<course name>> would have learned how to prepare a 3D model for the purpose of linking it to a Construction Schedule. APPLY (implement): Use <<software tool>> to prepare a 3D model for the purpose of linking it to a Construction Schedule. Organizational Team (OT) capability applies to two or more organizations working together (through partnering, alliancing, etc.) to pursue a common mission or deliver a common project/outcome. The CORE Competencies Tier reflects the personal abilities of individuals enabling them to conduct a measureable activity or deliver a measurable outcome. This core tier is subdivided into the following four competency sets: Foundational traits – personal attributes inherent in an individual that cannot be acquired through training or education; Situational enablers – personal attributes related to nationality, language and other criteria which may play a relevant role when delivering a service or a product; Qualifications and licenses – personal attributes related to the existence or sufficiency of academic degrees, scientific publications, professional accreditations, trade/skill certificates or licences; and Historical indicators – attributes related to employment history, project experiences (including project types and sizes), roles played and positions held. The DOMAIN Competencies Tier refers to the professional abilities of individuals, the means they use to perform multi-task activities and the methods they employ to deliver outcomes with complex requirements. There are eight competency sets within this tier: four primary sets - Managerial, Functional, Technical and Supportive - representing the main types of professional ability; and four secondary sets - Administration, Operation, Implementation and Research & Development - identifying those abilities which are formed by the overlap of primary sets. The EXECUTION Competencies Tier represents an individual’s ability to use specific tools and techniques to conduct an activity or deliver a measureable outcome. The ability to use a software tool (e.g. a 3D model authoring tool), drive a vehicle (e.g. a 30 tonne tipper truck) or operate specialized field equipment (e.g. a laser scanner) are examples of execution tier competencies. Also, the ability to employ specialized techniques (e.g. programming, drawing and plastering) is also classified under this tier. The BIM Competency Hierarchy includes three BIM competency tiers which are divided into several BIM competency sets which are, in turn, subdivided into BIM competency topics. These tiers, sets, topics - and their granular subdivision into competency items - represent all the measureable abilities, outcomes and activities of individuals who deliver model-based products and services. Competency Identification through analysing job advertisement; dissecting BIM-specific roles as defined within BIM guides, BIM management plans and similar documents; reviewing academic literature and industry publications; adopting and adapting formal skill inventories, competency pools, and accreditation criteria; and harvesting competency requirements from industry associations, organizations and subject matter experts. The Individual Competency Index (ICI) measures both conceptual knowledge (referred to as knowledge) and procedural knowledge (referred to as skill) which are needed by individuals in order to perform a defined activity or deliver a measureable outcome. Level 4 (expert) denotes extensive knowledge, refined skill and prolonged experience in performing a defined competency at the highest standard. The index also identifies two competency divides: the learning divide separating level 0 from level 1, and the time/repetition divide separating level 3 from level 4. However, although the ICI measures both knowledge and skill, it does not measure personal traits (typically referred to as attitude) which require specialized psychometric indices similar to Myers-Briggs and RIASEC. Also, the ICI only measures the abilities of individuals and - by extension, the aggregate abilities of a group of individuals - but does not measure the abilities of organizations, organizational teams or larger organizational scales (refer to BIM Capability Stages and BIM Maturity Levels). For a BIM perspective of how to apply the ICI in assessing BIM competencies, please refer to this article on BIMThinkspace.